Choosing a corporate travel agency can be tricky, especially in the booming city of Atlanta. Home of the Braves and the Technology Capital of the South, Atlanta has so much to offer the corporate traveler. From access to the world’s busiest airport to high tech conference spaces, any visitor can feel right at home while traveling to the capital of the Peach State. Here are three reasons to choose a corporate travel agency whose agents live and work right in the thick of it all. As a Forbes top five up-and-coming “tech mecca,” Atlanta is the home to a plethora of Fortune 500 headquarters. Companies like Delta Airlines, Coca-Cola, The Home Depot, and UPS are just a few of the headquarters within the Atlanta zip code. With that, the city is quite accustomed to hosting visitors from around the world. Hartsfield-Jackson Atlanta International Airport, named #1 U.S. airport by TripAdvisor, offers 2,500+ average daily flights, seeing to 104M passengers in 2016. In fact, 80% of the U.S. population is within a two-hour flight to Atlanta. Not to mention that the 1.2M square foot international terminal gives exclusive access to shopping and restaurants for passengers. Choosing an Atlanta travel agency that is well-versed in the busy Hartsfield-Jackson airport makes your planning easier. Atlanta is ranked as the #4 meeting destination in the U.S., according to cvent.com. The city of Atlanta has the largest concentration of convention hotels with more than 10,000 hotel rooms within walking distance of the Georgia World Conference Center (GWCC). The GWCC is a popular meeting place for conferences, trade shows, graduations, and sporting events. It’s important to note that the next conference your travelers attend may not be in downtown Atlanta or near the airport. In fact, it is probably less stressful for your corporate travelers to navigate the area far from the bustling downtown area. The metro area has quite a few options for other hosted conferences: Midtown, Buckhead, Sandy Springs, or Alpharetta, to name a few. In Midtown, the Georgia Tech Hotel and Conference Center offers a cutting-edge space for out-of-town guests. Visitors can utilize the latest audio-visual technology and take advantage of a complete meeting package, including breakfast, lunch, and refreshments. This space, among other hotels, is an attractive option for tech-savvy guests. With so many places in Atlanta for your corporate travelers to attend a conference or meeting, it can be overwhelming to plan. Choose an Atlanta-based corporate travel agency for a less stressful planning process. 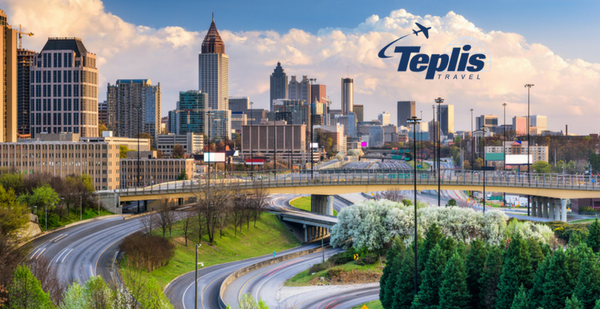 Since 1972, Teplis Travel Service has supported travelers around the world. We offer corporate travel solutions that combine the guaranteed lowest fares with experienced agents and highly customized service platforms. Contact us or give us a call today at 800-669-6547 to experience for yourself our standards of personalized service.